In case you hadn’t noticed, The Legal Genealogist is a DNA junkie. More money has gone out of this household in the last few years for DNA tests than for some entire categories of normal household budgets. But that’s because I can afford it. And that always stops me in my tracks. It makes me think how very lucky I am, that I have never had to choose between a keen genealogical tool I really want like a DNA test … and putting food on the table, or paying the electric or heating bill. I happened to be on Facebook when I read those words and, as I did, I noticed a name lit up on the right hand side showing a friend of mine was online. And she happens to work for Family Tree DNA. I put an idea to her, she took it up the line, and I am just thrilled to be able to say that, thanks to the generosity of Family Tree DNA, three lucky readers are going to have a happier holiday season. Thanks to the generosity of Family Tree DNA, I’m going to be able to give away three DNA test kits — one YDNA 37-marker kit, and two Family Finder autosomal kits. • The test has to be for you, though you can use the kit to test a member of your family. • You (or the person you’re testing) can’t have taken any other Family Tree DNA test, and strong preference will be given to those who haven’t had any chance to test anywhere. • You have to convince me — privately, by email, and not ever to be shared with another soul (except if I need help from Family Tree DNA with a tie-breaker) — that this really is something that would break the December bank in your household if you went and bought it for yourself. • If I need a tie-breaker, I’m going to give preference to the best brief explanation of why you want the test — again, totally private — so tell me what you hope to prove using DNA. • All entries have to be emailed (if you’re reading this via email, don’t just hit reply — make sure you use my [email protected] address for this) and they have to received by 11:59:59 p.m. (midnight) Pacific time on Sunday, December 20th. The YDNA 37-marker test looks at the kind of DNA found in the male gender-determinative Y chromosome that only men have.2 It gets passed from a man only to his sons and from his sons only to his grandsons and from his grandsons only to his great grandsons and so on, with few changes down the generations.3 So this can only be used by a man (ladies, think about your father, brother, uncles, cousins) and can help connect your male line to another, to confirm (or question) a surname and the like. I’ve used it just that way — to find and connect with cousins I didn’t even know I had, and to share information and research with them. This whole idea of trying to reach folks in our community who may not otherwise be able to test has caught the fancy of the folks at Family Tree DNA. And they’re going to watch this giveaway with great interest. If it gets the kind of interest that I think it could get, we have a good chance of getting Family Tree DNA to expand this — perhaps substantially — in the coming years. So… you really want to test your DNA, but you really can’t afford it? Tell me in a private, not-to-be-shared email. 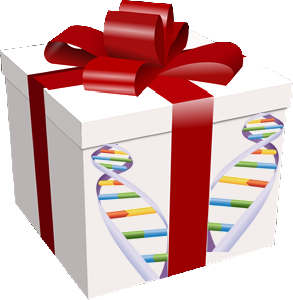 Because three lucky readers are going to get a test, for free, this holiday season, thanks to the generosity of Family Tree DNA. What a lovely idea! This is going to make some folks’ Christmases (or New Year) extra cheery. It’s always frustrating to be held back with a big project because of money. Thankfully this year we are not as bad off as in the past, but I know what it’s like to pass on experiences because of money problems. Major league credit to Family Tree DNA — which didn’t hesitate a nanosecond when I asked! What a great idea and gift!! I hope it will make 3 families Christmas a whole lot better, and that they (hopefully!) have a bigger family for Christmas 2016! It was so nice of FTDNA to join in on this, Sarah! Thank you for thinking of this great idea. Genealogy isn’t an inexpensive hobby, but for some, DNA testing means much more than dabbling in a hobby. For sure, three people are going to receive a fabulous, totally unexpected Christmas present from you and FTDNA. FTDNA gets a LOT of credit here, Linda! Kudos to you Judy for using your connections and thinking of others! Kudos to FTDNA for putting up the kits to give away!! Credit goes to FTDNA, Peggy! Thanks to you, Judy, and FTDNA for coming up with this idea to make someone’s holidays that much brighter! I wish you and your family the best in the coming New Year of 2016 as well! Thanks for the kind words, Pat, and happy holidays to you and yours! Great idea! I love the Christmas season because it makes people think about giving and sharing. I know we do it and could do it all year long, but Christmas just seems to bring out the best in people. My daughter once said when her family finances were tight, “money isn’t everything, but it sure makes life easier.” And, so your thoughtfulness and FTDNA’s willingness, may make someone’s research a little easier, if not a lot more interesting! Thanks for the kind words, Margie! Happy holidays to you and yours! If I can ‘piggyback’ on this to publicize another way to get assistance with DNA test costs, I’d like to mention the Pettypool Family One-Name Study DNA project. We have a limited number of Y DNA kits available for males (or male relatives of females) who think that they are Pettypools, but who have not been able to find a paper trail confirming the fact. In addition to the affordability criteria, preference is given to those who potentially are in one of the lesser documented branches of the family, but all will be considered. Please contact us through one of the email links at the website, http://www.pettypool.com, if you would like to explore this further. What an amazing gift to give to someone!! FTDNA really stepped up to the plate here, Amy. I’m so grateful. FTDNA gets a ton of credit for this, Chris! I suspect you’re going to be crazy busy trying to pick only three! You’re right about that, Chris, but it sure drives home how very lucky I am… that’s a blessing in and of itself. It’s really nice of Family Tree to offer and nice of you to bring it up with them, Judy. I spent around $3,000 over maybe a year-1/2 getting 3 mtDNA tests and one Y-DNA test on 4 cousins and a large number of Family Finder tests on two groups of my mother’s maternal/paternal cousins. But one cousin is 98 and had health problems this year; and another is 86, with her short-term memory slipping away on a daily basis. Another cousin on a different side of the family has Parkinson’s, so time is of the essence! No miracles yet on the FF tests, which take a LOT of time to go through. So many who take it either do not have pedigrees or do not have good pedigrees uploaded that go back more than a few generations or that include dates/locations. Or many don’t answer the emails we send. The mtDNA tests may never yield usable info, but we have three of our four great-grandmothers’ DNA, just in case. One of the cousins took the Ancestry test that now links to pedigrees and includes circles of people with the same DNA and/or pedigrees. I was doubtful, but she was immediately linked to 6 descendants of our brickwall 2nd great-grandmother’s brother! Her parents were unknown; she was born in New York, which is notorious for not having the best or most easily found records; and several years of research had gotten us nowhere. Two of the cousins have fab pedigrees; and we found our 3x great-grandparents, plus many of their early New England ancestors. I’ve done research on some of these families and already found links to John Alden and Priscilla Mullins. All for a $99 test! I’ll be spending the winter verifying that these links are correct. I’ve since tested four of the same cousins I tested on Family Tree with Ancestry’s 30% off sale, and we await their results. Hoping that I can use information from both tests to learn which areas on the Family Tree chromosome browser contain the DNA for the various families and have been playing with all the categories on GEDmatch. Will be busy for years to come! I’m just wondering if Ancestry might also be open to providing three of your readers free tests, and maybe the qualifications could be brickwalls that have been resistant to discovery for years of research. That’s fabulous PR for the test. I’d love to see other companies doing the same thing, Sharon — I can’t handle it myself (I’m swamped with these! ), but perhaps one of the other genealogy bloggers can ask them! Maybe FTDNA could setup a donation link on the FTDNA site for giveaways like this. Similar to the donation option we have on project pages. When is the deadline for entries, please? Sunday December 20th at 11:59:59 p.m. (midnight) Pacific time. Thanks! I’m a slow learner with poor vision. Not a problem! I sure don’t want anybody to miss the deadline! I remember the times when I was wondering where my next meal was coming from when I would dig out 50 cents, often in pennies, and buy a lottery ticket. I never won but the joy of thinking it could happen was enough to get me through some bad times. I wish everyone who entered could win, but that’s never possible, is it? So at least everyone had a chance, and — who knows — maybe that alone will help folks get through some bad times. Hope you have the happiest of holidays and New Years! Glad you’re getting your testing done, Juanita — and Merry Christmas to you and yours. I think I missed it! Would have loved to have mine tested! You are doing a great thing helping others get their DNA tested.